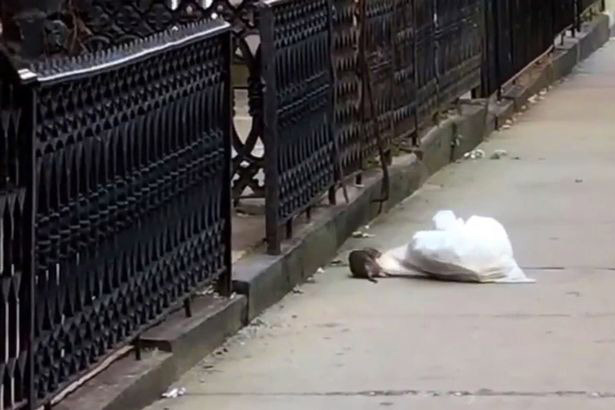 A woman who thought she had seen a rubbish bag move on its own was shocked to find a rat dragging the heavy load across a street. Leigh Conner started filming the bizarre sight she spotted as she was getting on her bike at around 6.30am on Monday. The impressively strong animal was spotted in Brooklyn, New York and Leigh told ABC 7 news she was shocked. She said: "I was getting on my bike and saw a trash bag moving, seemingly on its own. "When I saw at it was being moved by a rat I started filming." "After standing there for a minute with my jaw dropped, I realised I had to film it. "It was funny, because I had a conversation about pizza rat just the night before, making it an especially strange sighting." A rodent was dubbed Pizza Rat back in 2015 after being an viral sensation after he was spotted running odd with a slice. Leigh named her video: "Pizza rat strikes again!" when she shared it on social media. According to local media the man who owns the nearby house where the rat went underground said rodents are a huge problem in the area.